With training camp coming to a close for the Colorado Avalanche, it seems as if the storybook tale of former Denver Pioneers forward Logan O’Connor continues, as he looks to impress Colorado Avalanche and Colorado Eagles management. 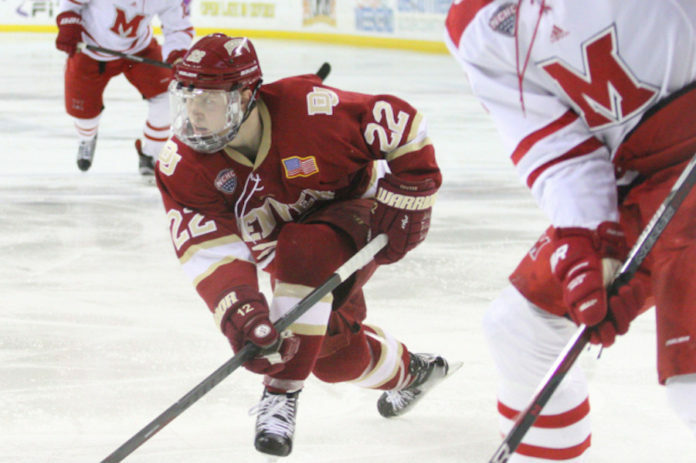 After coming off of a 21-point season with the Pioneers in his junior year, O’Connor attended the Colorado Avalanche rookie camp with the hopes of making an impression on the Avalanche management — and boy, did he ever. Jumping on the opportunity to make an impression in front of the Avalanche management, O’Connor tallied a hat trick in the game to help Team White come away with the victory over Team Burgundy in the inter-squad prospect scrimmage. With the contract in his hands, O’Connor officially decided to leave the Pioneers heading into his senior year in favor of beginning his professional hockey career with the Avalanche organization. Of course, training camp is a completely different beast. Spending the majority of training camp on a line with newly acquired and NHL veteran Matt Calvert and returning Avalanche forward J.T. Compher, O’Connor was able to get a good taste of what to expect if he wants to nab a spot on the Avalanche roster in the future. Avalanche head coach Jared Bednar tested O’Connor and Calvert in another way, putting them as a pairing on the penalty kill as they went up against the Avalanche top power-play unit at training camp early this week. 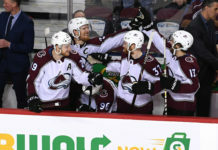 Along with being able to impress the coaching staff, O’Connor continues to earn praise from his potential Avalanche teammates. 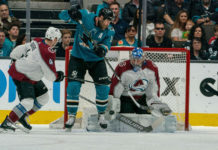 Following a hard-fought training camp, O’Connor made his debut for the Avalanche in the first preseason game of the season against the Vegas Golden Knights, where his line with Calvert and Compher started as the second forward line for the Avalanche. Despite the rough 5-1 preseason loss against the Vegas Golden Knights, it seemed as if the line of Calvert, Compher, and O’Connor were able to come close to multiple scoring chances throughout the night. Due to their hard work, they earned more ice time and eventually helped in scoring the lone goal for the Avalanche. From all of his hard work, he has gained the recognition and positive feedback from Avalanche head coach Jared Bednar.